Oil on canvas, 37 x 49 cm. Many of van Goyen’s beach pictures are from Scheveningen, and the same is probably true of this one. The beach is milling with activity despite the dismal weather. The birds appear as small black dots against the violent sky, the horse carriage filled with passengers is steadily working its way away from the beach and up the dunes. The landscape is overshadowed by a threatening sky and a storm that appears to soon begin raging. Stormy skies and thunderclouds were a frequent subject in van Goyen’s monochrome landscapes. 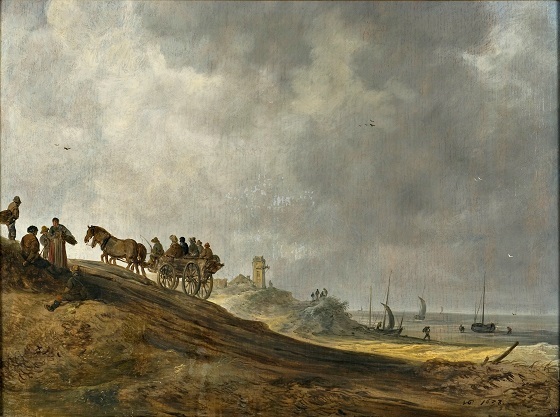 He painted countless beach pictures such as this one, which could be described as a Dutch portrait of an authentic grey day in 1638.